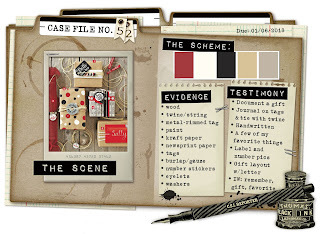 This is my solution to Case File #52 over at CSI - it's my last week as a Special Investigator for December and I have enjoyed every minute of it. It's been incredible to see my efforts featured alongside all the talented CSI Detectives. So here's the Case File (click on the image to enlarge) . 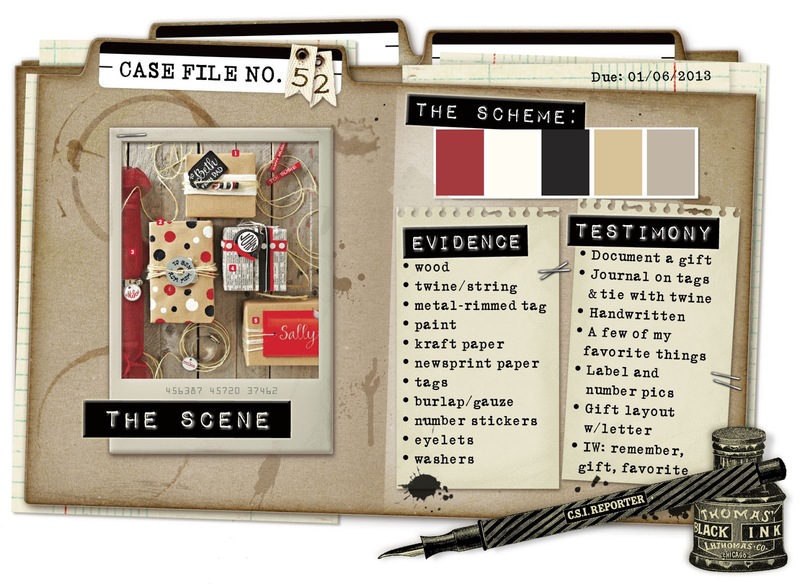 . .
You can also download the CSI Coordinates - a new set of fabulous printable elements and pp for each Case, designed by the amazing Michele Singh. One of the best things about Christmas for me is spending time with the people I care about. I don't get to see my boys too often these days, so it's wonderful when they manage to make it home for Christmas, if only for a day or two. 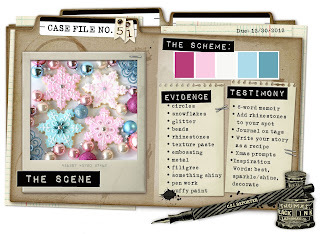 The Evidence: Wood - the little star; metal-rimmed tag; kraft paper - the bigger star and the tag bag; newsprint paper - behind the photo and newsprint stamped paper alphas; tags; circles - on the pp; number stickers - dymo printed; eyelets; twine. The Testimony: handwritten on the various tags, all about how much we enjoyed our day at Ian and Sally's. The hidden tag pulls out to reveal this picture of Rich having a post-prandial snooze! Grungeboard number, newsprint patterned stamped onto background. As well as all the extra stash, I also get to see one of my pages printed in a magazine which has been a source of inspiration to me since I first discovered scrapping, so I am really bowled over by it all. Thank you so much to all at Scrapbook Magazine and to the sponsors for their generosity - The Crafters Workshop, Heidi Swapp, American Crafts, Bazill Basics Paper, Basic Grey, Tando Creative, Fancy Pants and Maya Road. Lindsey Hopkins, editor of the magazine, contacted me a few weeks ago to tell me the news, but I had to keep it under my hat until the magazine came out. A couple of days later, Postie Nick delivered a giant pizza box - can you imagine how exciting it was to open the box and find all these gorgeous goodies?! Well, you can't see it all properly like that, so I took a few close-ups! Brilliant chipboard pieces from Tando Creative - can't wait to start playing with these - thank you Tando! These fab masks are from The Crafters Workshop - they're designer by an innovative mixed media artist called Julie Fei-Fan Balzer and I think they are going to be an inspiration to get going on my art journal at last - thanks Crafters Workshop! Gorgeous trinkets from Maya Road - can't wait to have a go with the little perspex houses - thanks Maya Road! Wow! I was thrilled to bits when I got home one cold wet Friday afternoon to find a little parcel of gorgeous tags waiting for me. The tag swap was organised by the lovely Carolyn Saxby, creator of Tag Tuesday - we each created five tags and sent them off, then Carolyn divvied them up and sent us each five tags by five different designers. It must have been lots of fun to go through all those tags but also lots of hard work. This one is from another Valerie - I love the vintage style and the pretty mixture of ribbons and beads tied through the top. Ho! Ho! Ho! Hope you're all having a Cool Yule wherever you are. Here are a couple of festive tags I made myself, but what I'm really excited about is the ones which came in the post from the Tag Swap - I can't WAIT to show you those! I thought this pretty colour combination together with the glamorous atmosphere of this Case would be perfect to showcase one of my favourite pictures from our wedding. We knew that it was a huge effort for Viv to make it to our wedding, but we were so glad that she did. This picture has captured a happy sparkly moment just after the ceremony. 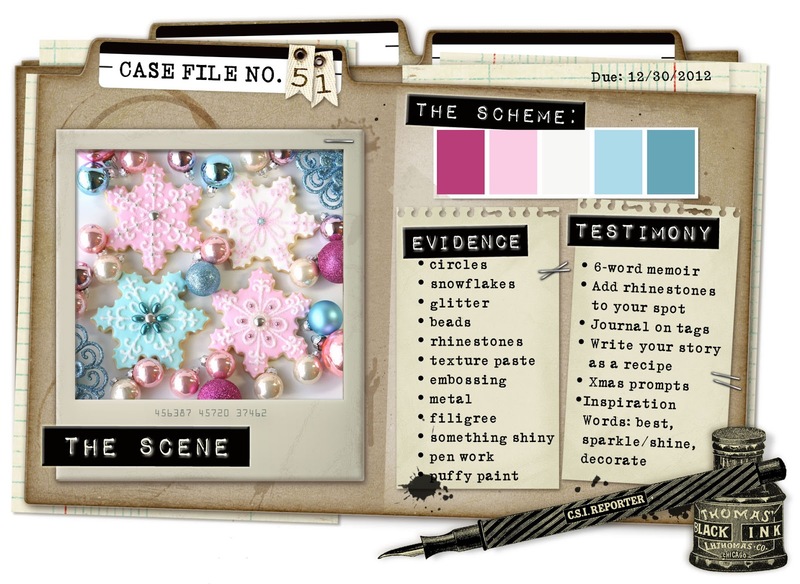 The Testimony: rhinestones added to journalling spot; I was also inspired by the words "best, sparkle/shine"
Journalling spot with added sparkles! It was fun to make a page without using any patterned papers - just a sheet of white and lots of scraps and trinkets. 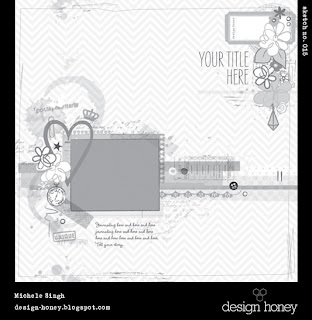 This was a fab sketch to use thanks Michele and a really fun Case File thanks Debbi!